Gigi Hadid and Doutzen Kroes Wear the Same Patchwork Denim Jacket: Who Wore It Best? Been around the world! This fall, Gigi Hadid and Doutzen Kroes both jetted around the world for Fashion Month — and they have the jackets to prove it! 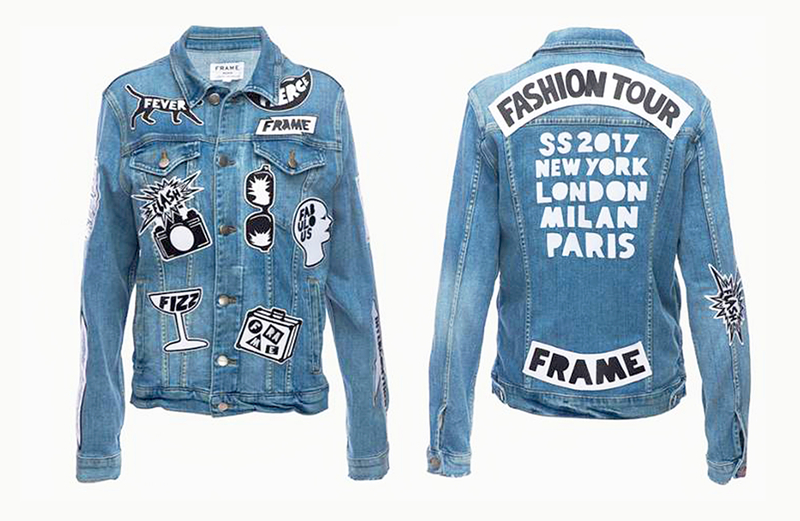 Hadid and Kroes were both fond of the same patched denim jacket emblazoned with their first names on the back. Hadid, 21, first wore a personalized Frame Fashion Tour jacket ($575 [similar style], frame-store.com) on September 15, 2016, during New York Fashion Week. After walking Marc Jacobs’ Spring 2017 show with colorful (and controversial) yarn dreadlocks, she changed into the oversized topper along with a black-and-silver cropped Local Authority L.A. T-shirt, skinny pants, black loafers, round sunglasses and a crocodile Saint Laurent Sac De Jour. The vintage-inspired jacket boasts a series of cheeky patches in such shapes as a flashing camera, dog and martini glass, among other items. Kroes, 31, also modeled her personalized jacket in New York City September 10. She went for a more streamlined look, tucking a heather gray crewneck T-shirt into leather bottoms. Kroes, who walked at Balmain, accessorized her look with every fashionista’s go-to accessory: a red bandana tied around her neck. While both beauties wore their jackets in unique ways, we have to ask — who wore it best? Vote in the poll below and let Stylish know.